Engage and inspire your kids this holiday season by giving the gift of science and space. Looking for ways to entertain your kids this holiday season? Put down the remote, set aside your smartphones and power down your game consoles, and turn everyone's attention to the stars. Stop looking down at touch-screen devices, and look up at the universe. 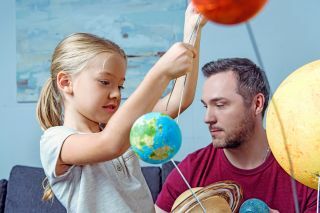 A new Kickstarter campaign led by my company DreamUp, along with Xtronaut Enterprises and NanoRacks, combines the realms of space and science gifts for kids with space-based experiment kits that imitate the same research projects that astronauts do at the International Space Station — only these versions of the experiments are geared toward kids ages 7 and up. The Xtronaut Space Station science kits sell for less than $30, making fun space education accessible to many people. An experiment kit is an homage to the awe of the past, a celebration of the opportunities of the present and a gift that will last well into the future. Think of the Nobel Prize-winning scientist who nostalgically recalls his first chemistry set. Picture the look on a young girl's face as she sees the Milky Way for the first time. Remember, too, the pleasure of finding things out when you were a child, solving puzzles and riddles, or studying science without a textbook by simply witnessing the natural wonders of the world. A gift of this kind does more to make space intelligible and accessible for every child, including those who are otherwise averse to science, technology and mathematics. Such a gift is immersive and contagious, opening children's eyes to the beauty of space and infusing them with so much passion and power that their friends will want to see what all the commotion is about. Compare that scenario to the social isolation of playing a game on a mobile device. There is no communication, unless the rapid movement of thumbs or a random outburst counts as conversation, where children have extreme focus but no concentration. They lack the chance to pay attention to something of global importance and the opportunity to ask questions and wonder what may be. If we want to change this situation — and indeed we must — we need to do our part as parents, teachers, friends or relatives to reveal how entertaining learning can be. We can start with a small step, which can become a giant leap on behalf of education and space-based research, in particular. That step is also a means to bond with and inspire a child, to revisit one's youth by encouraging a child's interest in science and space. That step is an instant hit for the holidays, where families can collaborate as a team of explorers. Let us make this idea a reality, elevating science to its rightful place here on Earth while we look in awe upon the heavens.